Sacramento is the proud home to many of the world’s leading climate change policy ideas and prescriptions to preserve our planet’s resources. Throughout the region, our friends and neighbors embrace an outdoor lifestyle, connected to nature and conscious of the food we eat, the environment we live in, and the resources we use every day. So when we began crafting Golden 1 Center – three blocks away from California’s Capitol – it was incredibly important that we reflect the values of our community, while demonstrating that environmental awareness can go hand in hand with comfort, world-class entertainment, and can serve as a cornerstone for our city to build upon. It is why we’re committed to making basketball the greenest sport, and help set a new standard of sustainability at Golden 1 Center. Our team can demonstrate that everyone – fans, neighbors, and observers – all can have an impact on the environment. Beginning with our planning, implementing green innovations were a pillar of the arena’s design. With over 300 days of sunshine, we knew that solar power was a must, but with our ambitious team driving the project, having PV on the roof wasn’t enough. 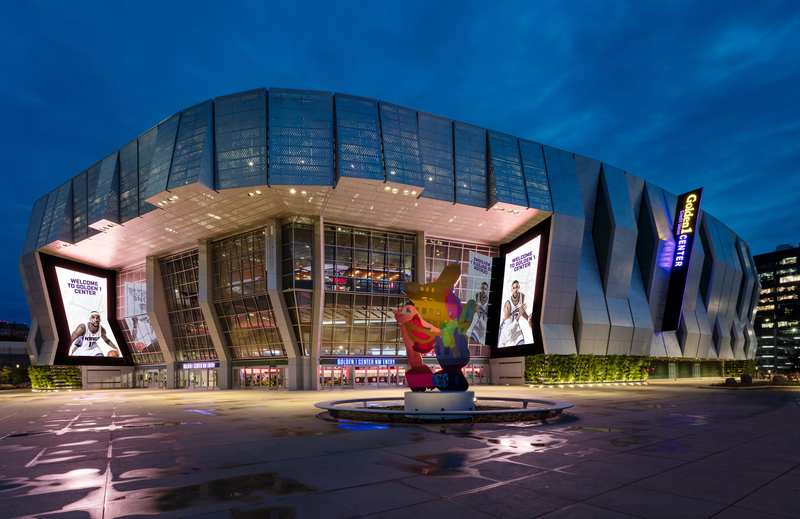 Through an urban-smart grid, we’re able to proudly say that Golden 1 Center is the only 100% solar powered arena in the world – eliminating 2,000 tons of greenhouse gas emissions generated by traditional energy sources. The architecture of the Grand Entrance is iconic and functional. The five massive hangar doors bi-fold and allow us to utilize a regional, natural cooling phenomenon – The Delta Breeze – to circulate fresh air through the arena and save on energy use. When the Delta Breeze isn’t flowing, we can turn on the one-of-a-kind displacement ventilation system that adjusts the climate at the fans’ level – under their seats – with low-volume, passive air that is more comfortable and efficient than typical forced, chilled air from above. Both innovations allow us to consciously use resources without sacrificing fan comfort. But the most comfortable thing in every arena is food, and we’ve made a groundbreaking commitment to ensure we’re operating smartly and sustainably. Sacramento sits in the most bountiful agricultural region in the world. We’re able to source the highest-quality produce and ingredients from our own backyard. To represent the values of our community, we’ve pledged to source 90% of our food and beverage program within 150 miles of the arena – increasing quality and freshness, while reducing vehicle miles travels and carbon emissions. Part of that pledge includes a 10-point charter that extends our commitment to identify responsible sources, extend our educational reach into our culinary program, support local businesses, and take steps to mitigate hunger in our region. When we looked at the elements of sustainability, it was important that we close the loop. Sacramento has plenty of sunshine to create a net-zero venue, but with the state in a record-breaking drought, we looked to solutions that would help conserve and reuse water efficiently. Ultra low-flow plumbing fixtures in our restrooms and water aggregation systems that help irrigate our drought resistant plant life in our plaza reflect our concern for scarce resources. We also wanted to close the loop and reduce the landfill footprint for the arena. That started with construction when we recycled 99% of the arena’s demolition materials – over 100,000 tons! And now, we’re working to close the food cycle as well. Any unserved food from events is properly packaged, chilled, and distributed to local food banks. Organic kitchen waste is sent to be treated, turned into a nutrient rich fertilizer and sent back to the farms and producers that source our incredible ingredients. Over 2 million guests will visit Golden 1 Center each year, and we want them to walk away entertained and informed. Here they’ll learn that everyone can have an impact on the environment – from the conscious choices they make about their food to how they power their homes and to be aware of the resources in their neighborhood. A core value of our mission is to enhance the lives of those we engage with – guests, fans, neighbors, and our colleagues across sports and beyond. We’re proud that we can represent our community by building the world’s first and only LEED Platinum Indoor arena. But we’re excited to be a part of a sports community that will continue to push the envelope on environmental awareness, creating greener buildings, dedicating resources to educating fans, and continuing to challenge each other to keep innovating.